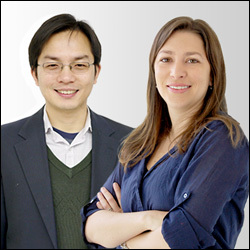 Assistant Professors Liangbing Hu (left) and Marina Leite (right). University of Maryland assistant professors Liangbing Hu and Marina Leite were named Maryland Outstanding Young Engineer and Maryland Outstanding Young Scientist in the academic sector, respectively, by the Maryland Science Center. Both awards are sponsored by the Maryland Academy of Sciences. Hu and Leite, who were chosen for their development of technology for solar energy, batteries and electronics, will be honored at an award ceremony at the center on November 19. The Maryland Outstanding Young Engineer (OYE) Award, established in 1988, was created "to encourage the important work of young scientists and engineers residing in the State of Maryland and increase public awareness of their accomplishments." Hu will be presented with the award's Allan C. Davis medal and a $2500 cash prize. The Maryland Outstanding Young Scientist Award (OYS), established in 1959, was created "recognize and celebrate extraordinary contributions of young Maryland scientists." Leite will be presented with the award's Alexander M. Haig, Jr. medal and a $2500 cash prize. Hu, who is appointed to the Department of Materials Science and Engineering (MSE) and is a member of the University of Maryland Energy Research Center (UMERC) and the Maryland NanoCenter, received his Ph.D. from UCLA in 2007. His research group develops and studies nanomaterials and nanostructures for use in energy storage (batteries), energy conversion, solar cells, printed and flexible electronics, wearable devices, and transparent paper. His work on a “battery made of wood” has been featured on National Public Radio, and a solid state lithium-ion battery he created with Professor Eric Wachsman (MSE/UMERC) was named the physical sciences Invention of the Year by the university's Office of Technology Commercialization. Hu was nominated for the OYE award by MSE professor and chair Robert M. Briber. "Bing is an incredibly creative and collaborative researcher who works with other engineers and scientists from across campus and around the world," says Briber. "Since joining the faculty, he has had tremendous impact, with numerous awards, high profile journal publications, media coverage of his work, and outreach to students. He is an outstanding engineer and his work has great promise for revolutionizing energy storage and conversion in batteries and solar cells." Video courtesy of the Maryland Science Center. Leite, who is jointly appointed to MSE and the Institute for Research in Electronics and Applied Physics (IREAP), received her Ph.D. from the Universidade Estadual de Campinas, Brazil, in 2007. Her research group focuses on the development of energy harvesting and energy storage devices, particularly high-efficiency solar cells, solid-state batteries, and plasmonics (metallic and highly conductive nanostructures). Using unique nanoscale imaging techniques to probe light/material interactions, the team is advancing our understanding of the optical and electrical responses of photovoltaic devices. Leite was nominated for the OYS award by IREAP director and Department of Electrical and Computer Engineering professor Thomas Murphy. In addition to Hu, three other A. James Clark School of Engineering professors have won the OYE Award: Professor William Bentley and Assistant Professor Chris Jewell from the Fischell Department of Bioengineering, and Associate Professor Ganesh Sriram from the Department of Chemical and Biomolecular Engineering.